My group and I designed a game for my personal favourite coffee supplier in Helsinki, Kaffa Roastery. The idea arose to my mind as I had recently delicately complained about the (terrible) taste of our office coffee – industrial Finnish brand, of which taste could be claimed has nothing to do with real coffee. My hopes were heard at work ( ❤ ) – we shifted over to Kaffa’s coffee. Yet the idea of Kaffa Roastery -app started to evolve in my mind; what would be better than a educational game about coffee for all office employees appreciating good coffee? Most people have no idea where the beans come from and what are the processes behind coffee production before it ends up to their cups. We want to give our support for small roasters in town and help them increase their sales, to both private and business consumption. This is our pitch to develop a game to Kaffa Roastery or any other quality coffee supplier wanting to increase brand awareness, awareness of coffee processes, and eventually increase sales. Finland has the highest coffee consumption per capita in the world. People have traditionally preferred quantity over quality, making quality coffee a niche market. What makes it even more challenging for local small specialty roasters is that they are not up-to-date with their digital tools. One of the largest sales channels are offices, where good quality coffee would be a valuable employee benefit, but the issue is hardly raised or thought after. Our focus of the research and game plan was on how to increase the sales of quality coffee to the offices (B2B sales). Our customer company was Kaffa Roastery, a small roastery from Helsinki, that is planning to invest heavily in digital marketing. Kaffa Roastery is competing against bigger providers in the office coffee market, but finds it difficult to reach these customers. Our target was to design a game that could increase the sales of Kaffa Roastery’s coffee and act as a guerrilla marketing campaign towards the office customers. We conducted a thorough market analysis on the current situation of the coffee market, supply chains of office coffee and the purchasing processes in different companies. Based on this analysis we understood that the decision-making regarding the purchase of office coffee is very distant from the end users and the process is seen as overly complicated. We chose a strategy to tackle the issue by bringing the options related to office coffee closer to the end users. Our aim is to increase the preference of good coffee within office employees. Our recommendation is to focus on education about the differences of coffee varieties. 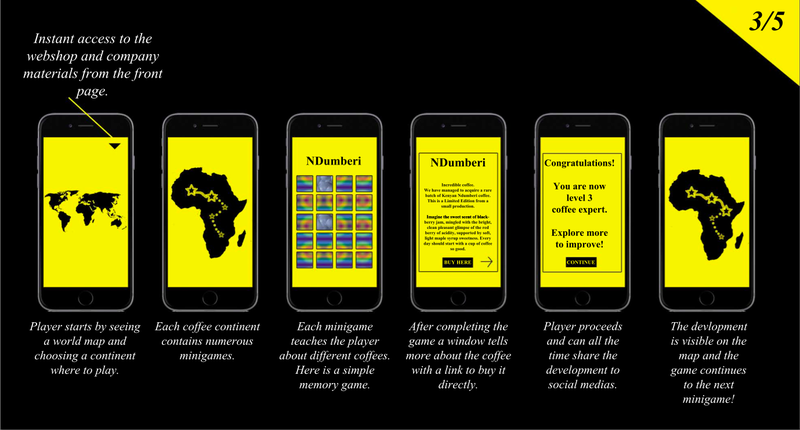 We want people to know more about the coffee they drink and therefore we have designed a game that takes the player through the different coffee varieties and different origin countries. In each of these destinations, player plays a mini game, that teaches about the coffee country or variety in question. A player progresses through the stages, gets badges and unlocks new games and can share the progress in different social medias. The game also gives recommendations of a suitable coffee for the user based on the responses and the playing style. The game is closely integrated to the web store and makes it easy to buy coffee and access additional information. Our research indicated that it is difficult to reach the target customers. Therefore we have created a marketing campaign to distribute the game to the wanted destinations. We also aim to introduce Kaffa Roastery as the digital market leader of coffee, by partnering with Slush ‘14 technology exhibition and promoting the digital aspect and disruptiveness of the business for growth-oriented companies. The objective is to increase the market share of premium coffee in offices. We aim to bind people more to the coffee they drink by educating them about the differences and positive effect that coffee can have. By this we aim to increase Kaffa Roastery’s sales, the partnerships with offices and the preference towards Kaffa Roastery’s products within consumers. Our estimate for the cost of the development is 10.000€, cost of marketing 10.000€ and the revenue target is 120.000€, with a margin of 50.000€. Therefore we highly recommend developing the game to increase sales and bring an innovative to the marketing of the company. Gamification and using gaming in digital marketing initiatives. 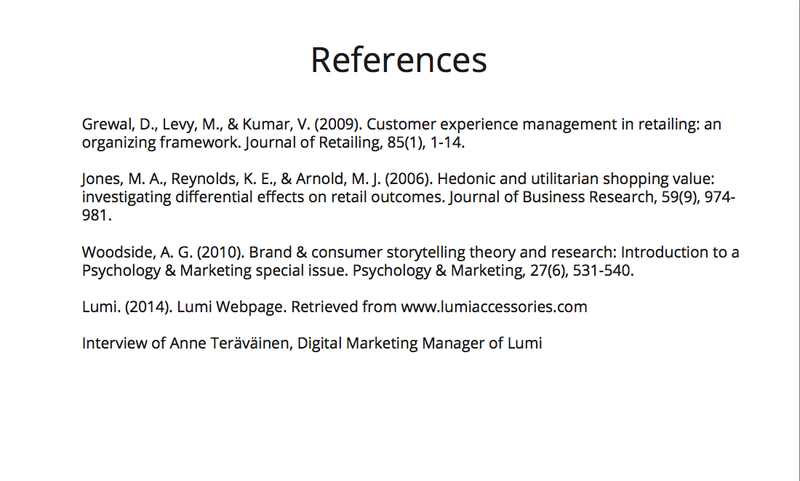 Market Dynamics & Company Research. 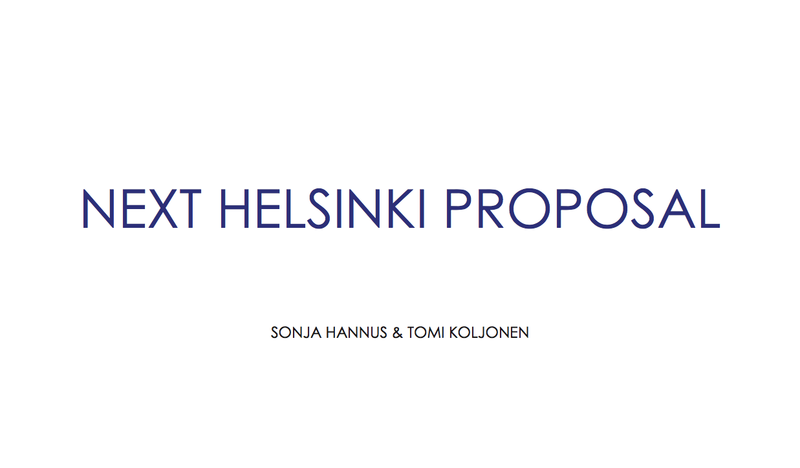 3.1 Market dynamics in Finland. 3.3 Current digital marketing initiatives. 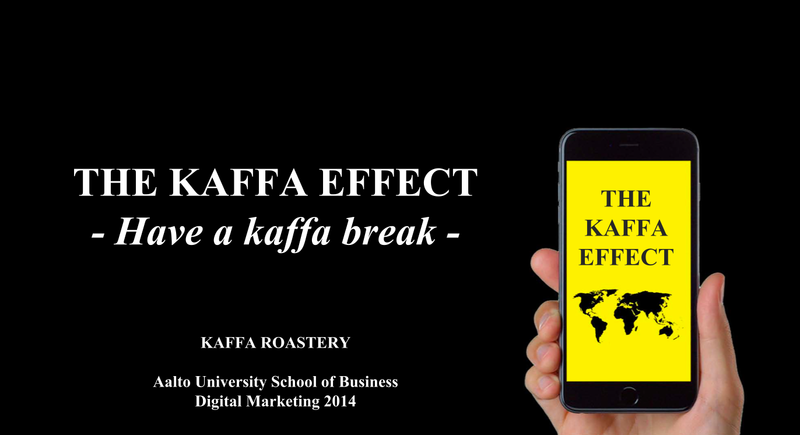 The Kaffa Effect – mobile game. 4.1 The direct challenges addressed. 4.2 The structure of the game. 4.3 Metrics used to measure performance. 4.4 Cost estimates for development and marketing. 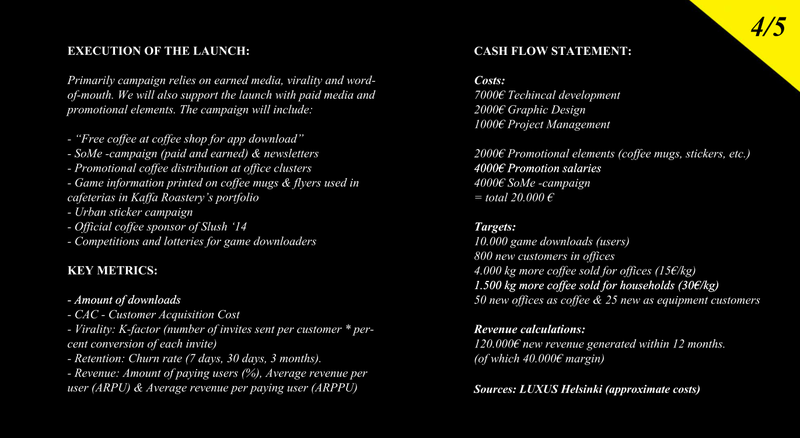 4.5 Launch of the game and guerilla marketing campaign. Motivation and method behind the solution. The objective of this report is to outline the reasoning behind the attributes of the Kaffa Effect game and provide a detailed description on the characteristics of the actual solution. The structure of the report is as follows. First we will present findings from scientific literature and various studies on gamification and using gaming in digital marketing initiatives. Secondly, we will take a closer look at the market dynamics regarding the services and products of our case company and analyze the current digital marketing initiatives undertaken. After which we will highlight which challenges of the company our solution will address as well as present the attributes of the solution and its execution. We will end the report by elaborating on how we came up with this solution as well as concluding remarks. The utilization of mobile applications and gamification in digital marketing is spurred by the transforming user behavior. In the United States, time spent on digital media has surpassed the time spent on watching television (eMarketer, 2013) and an average European spends around 1.5 hours a day on his/her cell phone, which is almost identical with the time that he/she spends on his/her computer (Epstein, 2014). On average 60% of social media activity is spent on smartphones and tablets instead of traditional computers (Adler, 2014) and the usage of mobile games is reaching the popularity of computer and console based video games (Aamoth, 2014). This change in behavior has been acknowledged by marketing experts and elements of digital marketing have been increasingly built in to mobile applications and games (Tottman, 2014). The first step has been to simply display commercials or advertisements in mobile games. The second wave of utilizing mobile games in marketing have involved the cooperation between game developers and traditional enterprises (IndustryWeek, 2012). As a result, special games have been based on services or products of partnering companies, and users have been able to gain an abundance of information about the companies during the gameplay. In some cases, for example, achieving a special level in the game directs the player to the website of the company, where the players can buy unique products or services for exclusive prices which are only available for the gamers. This approach can be seen to utilize gamification in marketing efforts, and the playing of the game is beneficial for the users, due to increased knowledge or received special offers. Several games also implemented tasks for purely educational purposes without commercialization features, which has helped in creating a positive acceptance among users. Huotari and Hamari (2014) define gamification as“a process of enhancing a service with affordances for gameful experiences in order to support user’s overall value creation.” The authors highlight that this definition emphasizes the goal of gamification rather than the explanation of the methods. They also state that there are no clear gamification elements, which would be valid only for games. Dashboards, levels, points, progression metrics could be also found at stock exchanges, decision support systems or loyalty programs (ibid). This section will provide insight into the market dynamics of coffee in Finland as well as provide an insight and justification to why the Kaffa Roastery was chosen as the target company. The company analysis will briefly introduce the company and look into the current digital marketing initiatives undertaken by Kaffa Roastery. It will also provide insight on how we believe the game will provide benefits for the company. According to trade statistics of the International Coffee Organization (ICO) Finland has the highest coffee consumption in the world when measured in kilograms of roasted coffee per person and the statistics show that in the past years as much as 1.1 percent of all coffee imports globally have been shipped to Finland (International Coffee Organization, 2013). The consumption has, however, remained rather stable in the past four decades (see figure 1). No clear statistics on the market share on specialty coffees were available, however according to Paulig 94% of the coffee consumed in Finland is light roasted, while the rest 6% are dark roasted or speciality coffee (Paulig Uutiset, 2012). Looking at the development of consumption, the sales director of Paulig Karri Kauppila predicts that while the coffee consumption habits are changing, the quantity of coffee consumed in kg per person is not likely to increase in the future (Ziemann, 2014). Based on our market research we understood that the current biggest providers are dominant in the office coffee market. They have their established networks and ways of working with heavy sales channels and marketing campaigns. They are mostly focused on the HR and decision-makers around the coffee purchase and don’t even try to talk for the end user. We see that there is a market for disruptive solutions that aim to increase the quality, create a more end-user focused branding and create the coffee offered in offices as an easy and cost-effective way to reward employees. Kaffa Roastery is a Helsinki based coffee roaster established in 2007. The origins of the company are in roasting special blends of coffee using high quality, fresh beans procured to as a high ratio as possible directly from coffee plantations. The company has grown rapidly and their coffee has received several titles in professional barista competitions. Currently the company offers a large variety of specialty coffee, coffee machines, accessories and service solutions such as continuous fulfillment and maintenance contracts. The sales are targeted at individual homes, offices and the HoReCa (hotel, restaurant, Cafeterias) branch. 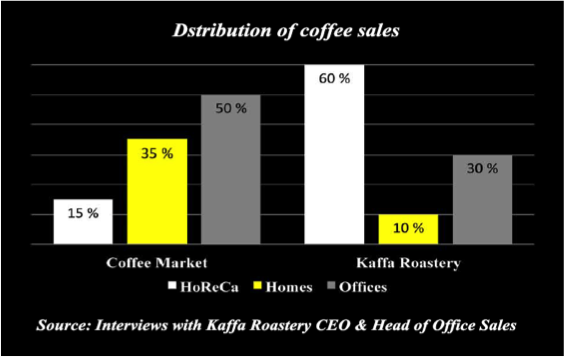 Based on the findings from our interview with the CEO and Head of Office Sales of Kaffa Roastery, there exist significant unutilized potential in the sales to offices. The picture below depicts the how the sales of coffee is divided between these three branches both in the industry in general and at Kaffa roastery. From this we can derive that there exist significant unutilized potential in the sales to offices. New media (social media, blogs, video sharing services etc.) and the proliferation of mobile smart devices has changed the marketing landscape. The traditional sales funnel approach assumes that consumers begin with a large variety of potential brands in mind and methodically cut down on the choices until they decide to buy; while after the purchase the relationship with the chosen brand is typically focused on the use of the product or service itself (Edelman, 2010). New research, however, indicates that rather than systematically narrowing down their choices, consumers tend to add and subtract brands from a group under consideration, and do this during an extended evaluation phase (ibid). The new media, has also led to the consequence that consumers tend to enter into an open-ended relationship with the brand and share their experience with it online (ibid). This means that the marketing investments are needed to be highly focused on helping consumers navigate the evaluation process and then spread the positive word of mouth about the brands that they have built a bond with (Edelman, 2010). One can therefore derive, that it is extremely important to invest in marketing initiatives that help in building brand preference and make it easy and intriguing for consumers to build a bond with the brand. It has also been found that if the consumers’ bond with the brand is strong enough, they are likely to repurchase it without cycling through the entire earlier decision journey (Edelman, 2010). As a result of the proliferation of mobile smart devices as well as the maturation of new media, we are also witnessing an emergence of social commerce. Barnes (2014) defines social commerce as a subset of e-commerce involving the use of social media that supports social interaction and user contributions, to assist in the online buying and selling of products and services. What this means to companies, is that they need to provide customers and consumers well designed and integrated digital tools and platforms that enable a seamless purchasing, sharing of experiences and advocating the brand. Looking at the findings above, we aim to evaluate the current digital marketing initiatives of Kaffa Roastery and identify how we could assists them in their digital marketing efforts. We understand that the traditional sales funnel view is no longer totally valid in digital marketing, however in order to clearly structure the findings we utilize rather traditional three elements: Increasing brand awareness, Increasing brand preference and Driving sales. Kaffa Roastery aims to build brand awareness in social media channels mostly through organic exposure. As organic exposure requires effort, Kaffa Roastery actively updates its Facebook and Twitter accounts. Having over 4000 likes in Facebook and 1100 followers in Twitter gives them a solid follower base. In addition to this Kaffa Roastery and their products are featured in several blogs. Kaffa Roastery aims to build brand preference by creating and distributing valuable and relevant content to its target group through its digital marketing initiatives. Currently the distribution of the content is focused on the same social media channels focusing also on building brand awareness. According to the CEO, Svante Hampf, the aim of the company is to increase the role of targeted content marketing bringing it in the center of their digital marketing strategy. Therefore we see that a new channel, a mobile game, educating about the differences of coffee varieties would be a valuable supplement. 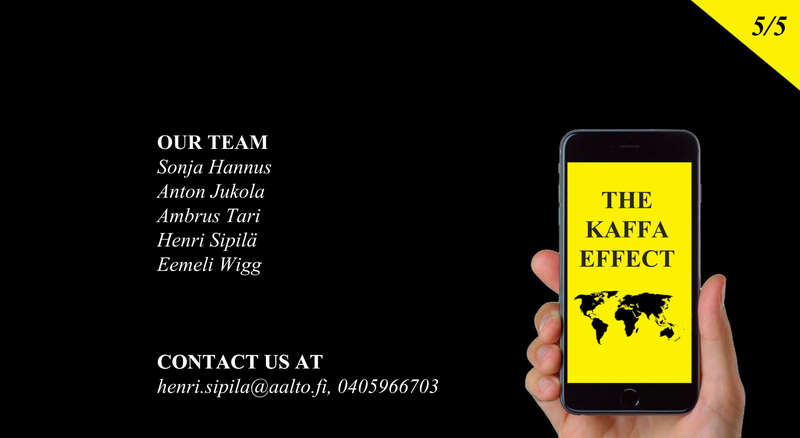 Based on interviews with the CEO, Svante Hampf, and the Head of Office Sales Ari Luostarinen, driving sales in Kaffa Roastery has been undertaken to large extent by utilizing conventional strategies, such as telephone and face-to-face contact by their sales representatives. However the company aims to concentrate investments in the future on digital sales solutions. At the moment the digital marketing initiatives in this area are concentrated on their webstore on their own homesite, in which they also provide an automated tool to assist offices to evaluate the most appropriate solution for them (see the following pictures). By reviewing theory on gamification and analyzing the current and desired digital marketing initiatives of the company, we decided to develop a mobile game, which would educate the players about the varieties and proprieties of a good coffee. In our vision Kaffa Roastery would act as the core service provider of the game. We decided to focus on the education and turning people who are aware of Kaffa Roastery to start to prefer its’ coffee. This game was designed to create excitement and educate the player of the origin, quality and the processes of what happens to coffee before it ends to one’s cup. Once people play and share this game at the office, they will mutually question the current coffee provider and consider Kaffa Roastery as their coffee provider. The game will provide recommendations on the suitable coffee solutions for different offices based on the amount of employees and taste towards coffee. We feel that this is an issue that affects to the satisfaction of employees notably. 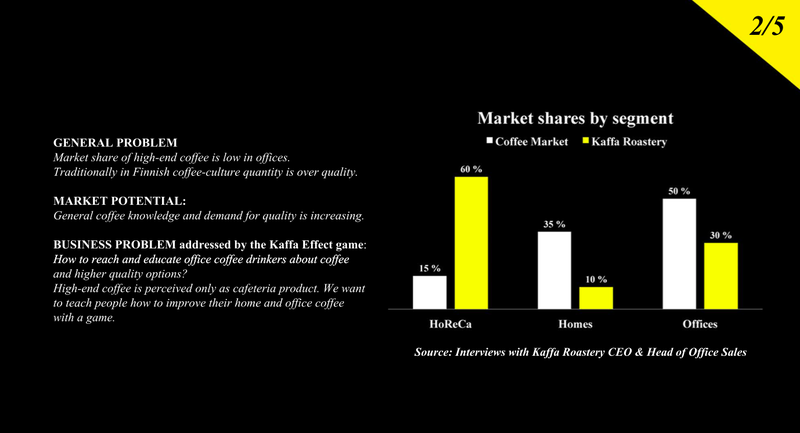 People will not just love the taste of Kaffa’s coffee but be also proud of having it in their office, thus the game is very potential in changing awareness into preference in the sales funnel. For companies this is a simple trick of remuneration and employee satisfaction. The best part is that it is very easily measured, as the satisfaction towards the office coffee can be easily interviewed. Creating before/after -interviews and analyzing the change would be important for the companies to justify the decisions and also for Kaffa Roastery to further market their solutions. We wanted to create a game that is cool to play and will make people share it to their friends. We wanted to make it educational yet interesting. People will play to miniature games to unlock quick facts about coffee. These games are traditional games such as Sudoku, Memory Game, Trivial and such. They are relatively easy to pass, but demanding enough to keep the player’s interest and motivate them to “achieve”, and unlock the information. After raising the excitement and interest, we have designed a tab to give recommendations and contact Kaffa to order coffee. Proceeding to the ordering process is done super easy for the player, yet not pushy. A clear challenge identified for the company is that people are not aware of the major differences in coffee varieties. By educating the target group it is possible to increase their attention to the origins of the coffee as well as to the selection of assortments. Also as stated above, in the future the company wants to invest in enhancing the level of content marketing and in digital sales solutions. Our game offers a strong alternative to enhance content marketing and education through a new complementary digital channel. The player will learn about origins of coffee areas around the world, beans and other factors that affect the coffee beans taste. The game will also teach about the processes that beans go through before ending up to your cup. Landing page will include the heading and below a world map and a game progress bar. Page will also include a dropdown box for Information about Kaffa, link to shop etc. Key element is the map and by pressing each continent you will proceed to next page. Every continent has its own map and within the continent you will find icons that represent information that can be unlocked through playing a mini game through. For example in Kenya you will unlock facts and pictures about Kenyan coffee. To unlock the information player needs to play a mini game. After playing that player can advance to next point on the map, for example Ethiopia etc. Playing game and unlocking information will also ad points to players progress bar. Each continent that has coffee plantations will have its own map (Asia, Africa, South- and Middle America). In Europe and especially in Finland player can learn about the processes that are made here such as roasting, grinding and brewing. Mini games such as Memory Game (matching pairs), Hanging Man (not hanging but same idea), Sudoku and Fact Quiz have to be passed to unlock the information. Especially in the beginning games will be easy but will get harder as player progresses. Also the information unlocked will get from very basics to more niches. As the player advances he will get awards (badges, discount codes etc. ), which can then be shared on Facebook and other social medias. Awards will include badges that player receives when progressing on the game for example when every 1/5 is accomplished. Badges can be shared on social medias and will say for example: “you are now Barista level coffee explorer” etc. This social media sharing will help game get more players and audience. These rewards will also give player feelings of accomplishment, which are a powerful psychological tool. In addition to these awards, player will receive every now and then real life benefits by offering discounts and free deliveries etc. The game would also do these every now and then surprise discounts to attract consumers. See illustrative mock-up below. CAC – customer acquisition cost and cost for additional kilo sold. Goal is to get 1000 new office employee customers (50 offices of 20 employees) and sell 6500 kilos of more coffee. With predicted costs of 20 000, CAC would be 20e and cost for additional kilo sold would be 3,08 euros. The game will be designed for both the iOS and Android platforms and distributed through the designated app stores. The launch will be promoted and supported by a social media campaign in Kaffa Roastery’s Facebook and Twitter pages. We do, however, believe that this will not be enough as our research indicated that it is difficult to reach the target customers. Therefore we have also created a guerilla marketing campaign focused on office customers, in order to distribute the game to the wanted target markets. During this campaign coffee will be distributed in our target area by using Kaffa-style take away coffee cups with game information on it, instead of the current “basic” cups. During the campaign customers also get to pick a free coffee from Kaffa Roastery in exchange for showing the downloaded app. Kaffa will naturally promote the game in their newsletter and we will print out urban stickers designed for this campaign. We also aim to introduce Kaffa Roastery as the digital market leader of coffee, by partnering with Slush ‘14 technology exhibition and promoting the digital aspect and disruptiveness of the business for growth-oriented companies. We have ourselves experienced the problem of bad office coffee throughout the years in the corporate environment. The offices that aim to have good coffee are very rare. People (including us) are unsatisfied of the quality and taste of the coffee served in offices, but are unaware of better options out there. We want to bring the decision making and voice to participate in decision-making of coffee provider to everyone in the office, not just to the HR department. To decide the game details and have better understanding of the market, we did a thorough research on the supply chain of office coffee. We interviewed different offices coffee-purchasers, Kaffa Roastery’s CEO and head of office coffee sales and also a representative of a competing roastery. This was done by simply calling the Kaffa Roastery people explaining the situation and walking in to the competing roastery to ask questions about sales to different offices. This gave us understanding of the sales, distribution and decision-making situation related to purchasing coffee in offices. It was evident that the purchasing process of office coffee is not very thought-after, the decision-makers simply aim to fill a need without focus on the coffee quality or the end user. The different alternatives and details are not considered nor transparent. Based on our market research, interviews and experience from offices, we see that gamified experience could be a truly disruptive option to increase preference towards good coffee. We want to widen the pool of decision-makers related to this and brand office coffee more strongly for the end users. By educating people about the differences and processes of coffee we hope to create a common subject of talk to any office between any employees and improve work satisfaction that way. Overall we find that games and many traditional systems share elements such as dashboards, levels, points and progression metrics. These can be found at stock exchanges, decision support systems or loyalty programs and are very important for the experience, behavioral analysis and as a motivational element. This further supports our analysis, that marketing games can be an additional element or channel to a marketing campaign. The game that we have designed aims to enhance the digital marketing efforts of Kaffa Roastery and further support their digital marketing activities. It tackles the number one challenge that their content marketing strategy at the moment has, reaching the relevant end users. This is done with a promotional launch marketing campaign targeted to channels with potential customer base and in-game social aspects that are built to spread the game organically. Aamoth, D. (2014). Here’s How Much Time People Spend Playing Video Games. Time Inc. Network. Online. Available at: http://time.com/120476/nielsen-video-games/, [Retrieved 10.10.2014]. Adler, E. (2014). Social Media Engagement: The Surprising Facts About How Much Time People Spend On The Major Social Networks. Business Insider. Online. Available at: http://www.businessinsider.com/social-media-engagement-statistics-2013-12, [Retrieved 10.10.2014]. Barnes N.G. (2014). Social Commerce Emerges As Big Brands Position Themselves To Turn “Follows”, “Likes” And “Pins” Into Sales. Marketing Management Association Spring 2014 Proceedings, Chicago, United States, March 26 – 28, 2014. Online. Available at: http://www.mmaglobal.org/publications/Proceedings/2014-MMA-Spring-Conference-Proceedings.pdf, [Retrieved 08.10.2014]. eMarketer (2013). Digital Set to Surpass TV in Time Spent with US Media. Online. Available at: http://www.emarketer.com/Article/Digital-Set-Surpass-TV-Time-Spent-with-US-Media/1010096, [Retrieved 10.10.2014]. Epstein, Z. (2014). Horrifying chart reveals how much time we spend staring at screens each day. BGR. Online. Available at: http://bgr.com/2014/05/29/smartphone-computer-usage-study-chart/, [Retrieved 10.10.2014]. Hamari, J., Koivisto, J., & Sarsa, H. (2014). Does Gamification Work?–A Literature Review of Empirical Studies on Gamification. In System Sciences (HICSS), 2014 47th Hawaii International Conference on System Science, pp. 3025-3034. Huotari, K., & Hamari, J. (2012). Defining gamification: a service marketing perspective. In Proceeding of the 16th International Academic MindTrek Conference, pp. 17-22. IndustryWeek (2014). The Age of Apps: Evolution of the Mobile Application. IndustryWeek. Online. Available at: http://www.industryweek.com/information-technology/age-apps-evolution-mobile-application-infographic, [Retrieved 10.10.2014]. International Coffee Organization (2013). Trade Statistics. Online. Available at: http://www.ico.org/trade_statistics.asp, [Retrieved 8.10.2014]. Paulig- uutiset (2012). Kahvi pysyy arvossaan maailmanlaajuisen kysynnän kasvaessa. Online. Available at: http://www.paulig.fi/paulig_news/3/kahvi_pysyy_arvossaan_maailmanlaajuisen_kysynnan_kasvaessa, [Retrieved 08.10.2014]. Tottman, P. (2014). Can you believe that the first mobile phone with internet access was released in 1996?. Mobile Entertainment. Online. Available at: http://www.mobile-ent.biz/industry/market-data/infographic-the-evolution-of-mobile-advertising/043597, [Retrieved 10.10.2014]. Ziemann, Marcus (2014). Rakas kahvi – Suomessa juodaan niin paljon, että enempää ei voi. Online. Available at: http://yle.fi/uutiset/rakas_kahvi__suomessa_juodaan_niin_paljon_etta_enempaa_ei_voi/7509365, [Retrieved 08.10.2014].